Dear European Space Agency. While landing on a comet was a freaking awesome milestone in the history of space exploration, for Christmas can you pretty please make these awesome little space microchips real? These are microsections taken from printed circuit boards (PCBs), being considered for use by coming ESA projects. Such boards are key building blocks of space missions. The microsections are cast inside resin to make them easier to prepare and inspect on a microscope, in some cases with dye added to help detect defects and reveal any materials and processes underperformance. ESA's Materials and Electrical Components Laboratory – based at the ESTEC technical centre in Noordwijk, the Netherlands, and equipped with powerful diagnostic tools, including optical and scanning electron microscopes – has the task of checking if the performance and workmanship of candidate boards and assemblies meet rigorous space-quality standards. 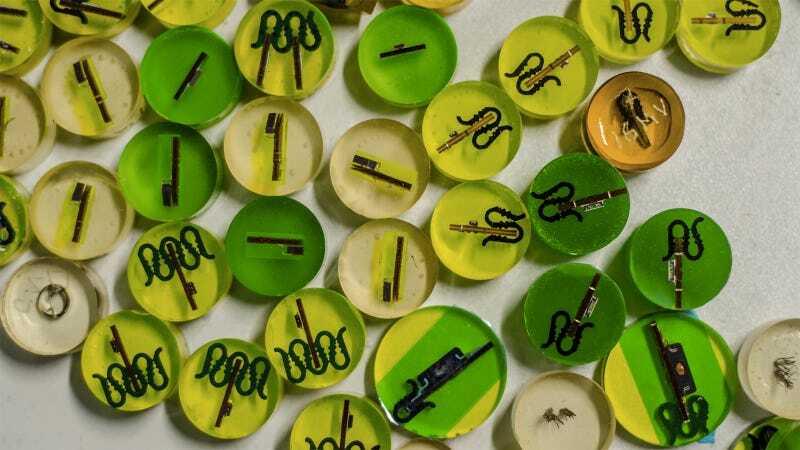 Embedded within these resin discs are vital clues to determine whether future space missions will fail or thrive: any defect in the PCBs, or in the soldering process used to attach components to the boards, could impair satellites, or even lead to the total loss of a mission.